Lay the colored paper out on the floor or table. 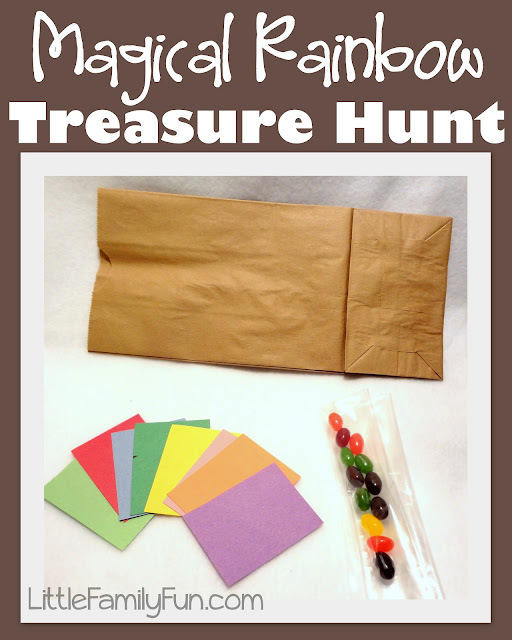 After they find something of every color in the rainbow, shake the bag and tell them that with all the colors of the rainbow the bag has created a magical rainbow treasure! Then pull out the candy or crayons. adorable activity! Thanks for the suggestion! So fun! I'll be doing this tonight, my son loves skittles so this would be so fun to give him that way! Linda you really are a creative genius. I'm not even kidding!